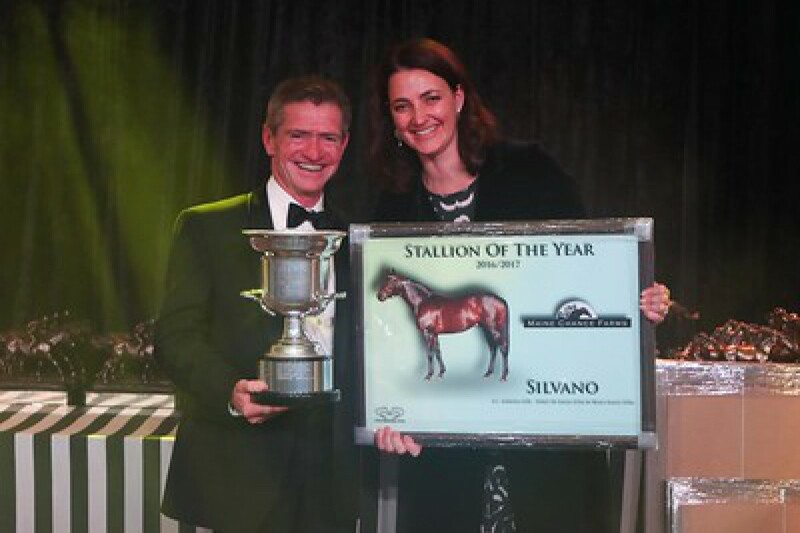 Silvano was named 2016-17 Stallion Of The Year at this week’s Cape Breeders Awards evening, held in Stellenbosch. The country’s leading stallion of 2013-14, our flagship stallion claimed a second Champion Sires’ Title when ending the 2016-17 racing season with all-time record progeny earnings of R27,867,675. Such was his dominance, that he finished nearly R8,7-million ahead of the runner-up, Klawervlei’s deceased former champion Captain Al. Silvano ruled supreme in a spectacular season which yielded 13 individual stakes winners. No stranger to dominating top level events, his progeny filled three of the first four places in the country’s premier race, the Durban July. In a blanket finish, sons Marinaresco and Al Sahem were separated by a head, while daughter Nightingale, missed third place by a shorthead. She had led home paternal half-sister Star Express in the Gr.1 Majorca Stakes earlier in the year. Now bound for Dubai, Gr.1 SA Derby hero Al Sahem headed yet another fine classic crop for his sire, which also featured Gr.1 SA Fillies Classic victress Orchid Island and Gr.2 Gauteng Guineas and Daisy Guineas winner Janoobi. We are grateful for the dedication of his connections – shareholders and breeders who have been supporting him throughout the years, owners and trainers who believe in the potential of his off-spring, and the grooms who watch over him.